Two shepherdesses invite you to laugh, cry, and contemplate as you read the stories of what their sheep have taught them about themselves, others, and God. Between the two of them, Marilyn Bay Wentz and her mother, Mildred Nelson Bay, have seven decades of sheep raising experience. Marilyn and Millie’s stories range from hilarious to thought-provoking, but always entertaining and inspiring. 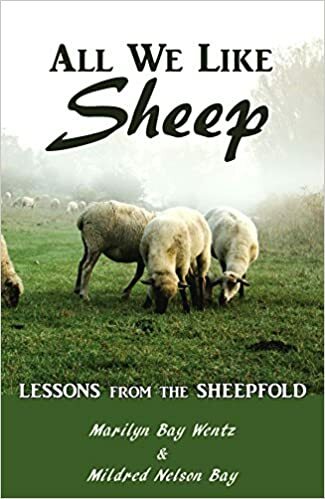 from the sheepfold, a spiritual lesson from life experience and Scripture, followed by reflection/discussion questions, and a prayer designed to lead the reader into personal communication with the Good Shepherd. Dive into these stories individually or with a group, and learn why sheep are mentioned more than any other animal in the Bible. Marilyn Wentz graduated with a BA in Journalism and a minor in Spanish from the University of Northern Colorado. She edits two national agriculture publications, Bison World and Open Pastures. Prior to settling down in her native Colorado, she was general manager of the Taiwan public relations branch of Saatchi and Saatchi Advertising, then the world’s largest advertising agency, and also spent six months in rural Costa Rica. She is fluent in Spanish and speaks conversational Mandarin Chinese. She now operates Prairie Natural Lamb. She also enjoys training horses, is a certified Colorado 4-H horse show judge, and is active as an AWANA leader. Marilyn has authored a novel, Prairie Grace (Koehler). She enjoys her two daughters—Kelly, who is grown and married, and Shannon, who is in high school. Millie Bay is Marilyn’s mother. She has lived in Colorado all her life except for two years in Fairbanks, Alaska. Millie has served as an AWANA leader, Sunday School teacher, member of Gideons International, and a 4-H leader. Millie has raised sheep for forty years, including lambing-out as many as 100 ewes per year. As a writer, she has had numerous articles published in local newspapers and several in the State Gideon Lamp. Millie is married to Marvin, and they have three grown daughters: Shelly, Marla, and Marilyn; and ten grandchildren. Marilyn and Millie have co-authored ALL WE LIKE SHEEP. I was blessed with this book in exchange for my honest opinion. I am not under obligation to give a positive review. This devotional is not only insightful and encouraging, but also exciting and fun to read. I learned quite alot about sheep and how much we really resemble them in our behavior. Also, how much Jesus is like a good shepherd taking care of us, His sheep. The author's have lots of experience with sheep after raising them for years. They share interesting stories of their sheep raising adventures, as well as some pictures for our enjoyment. Each devotional lesson includes a Scripture, a prayer, a short story and some thought provoking questions. One lesson was on hearing the voice of the shepherd including a comparison to how the sheep listen only to their shepherd's voice. They have to be trained to listen to it. It takes time and work, but eventually that is the only voice they will listen to, even if another person has a voice which to us may sound exactly like the shepherd's. It is all very fascinating indeed! Scripture compares us to sheep, what better way to understand that comparison than by studying it from a real shepherds point of view? There is much insight to glean from this devotional. I certainly plan to keep my copy around for a while. I am sure you or anyone else would enjoy it. It would certainly make a nice gift. Don't Miss the FUN FALL GIVEAWAY!! To Enter: Leave a comment telling me something you are thankful for. I am thankful for shepherd, especially the Good Shepherd, Jesus Christ. :-) I enjoy learning more about shepherds. Learning the comparisons to us as sheep and Jesus as our Shepherd has always fascinated me. The Scriptures also portray him as the sheep going to the slaughter for us. Awesome and Amazing!! There is always more to learn. I'm also thankful for all the comparisons God has given us with sheep and shepherding. I am so glad my publisher sent All We Like Sheep to you, Aimee. Thanks for the review. As I enter another lambing season, I am again reminded of the blessings and lessons we all can learn from sheep and shepherds. I'm so glad my publisher provided you with this book, Aimee. Thank you for the honest review. As I enter another lambing season, I am reminded how much we can learn from sheep and shepherds. It is no mistake that the humble sheep is the most mentioned animal in the Bible.